Members of the sage family are known worldwide as excellent herbs and beautiful garden plants. 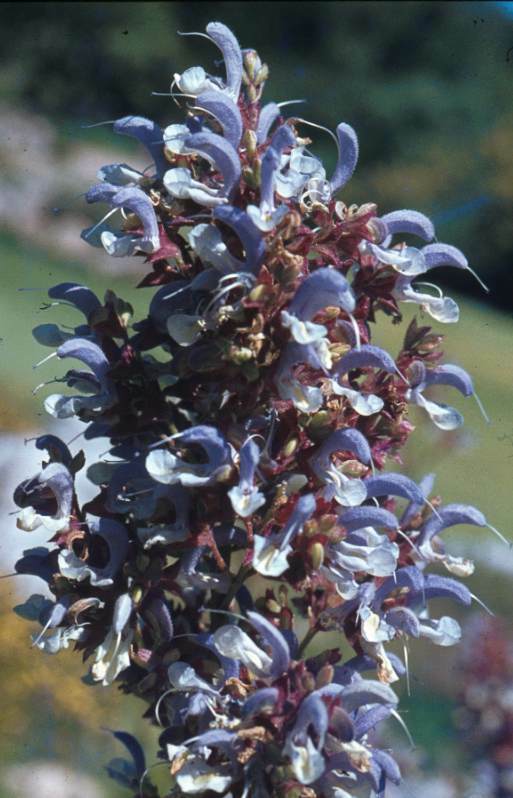 Salvia chamelaeagnea, which grows wild in the south western Cape, is no exception. Salvia chamelaeagnea forms a dense shrub, growing almost 2 metres high, with many strong, upright stems. The stems are square- shaped, a typical feature of the family Lamiaceae. Leaves are formed opposite each other along the stems or on short side branches, and often grow in tufts. The bright green leaves are slightly hairy and sometimes the edges are toothed. The leaves are dotted with glands which emit a very strong scent when touched and leave a sticky, bitter-tasting residue on fingers. 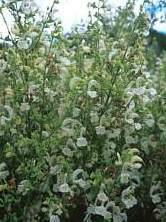 The flowers are formed in whorls along the top third of the stems, any time between November and May. Individual plants flower for a month or two. 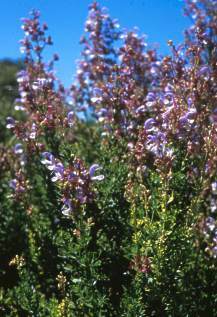 The flowers are on small side branches; opening from the bottom upwards towards the tips of the stems. The large calyx is usually an attractive reddish-purple colour. It is covered with small hairs and is also dotted with glands. The corolla, which we usually call the flower, varies in colour from blue, mauve, pink to pure white. Flowers with a dark blue top lip and white lower lip are the most common. In southern Africa 22 Salvia species occur naturally, with most of them distributed through the south western Cape. Between 800 and 900 species of Salvia are found in the temperate and tropical regions of the world. Flowering bright blue during the long hot summers, these plants are easy to find in the dry landscape where they grow along seepage areas, riverbeds and in sandy soil among rocks. 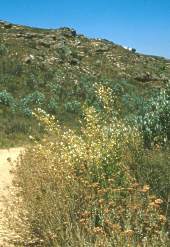 Salvia chamelaeagnea is well adapted to survive fires, which regularly sweep though the fynbos vegetation, by resprouting from its woody rootstock. Like many of the other sages, Salvia chamelaeagnea is used for a wide variety ailments such as coughs, colds, diarrhea, colic, heartburn and flatulence. A tea, to be sipped slowly a few times a day, is usually made from the fresh or dried leaves and flowers. Salvia chamelaeagnea is an evergreen shrub that is easy to grow, flowering in a range of colours through summer. With its upright growth and fresh green foliage it also provides texture contrast in a planting. For best results, these plants require full sun, well-drained, good garden soil and regular water, especially in winter. The blue Salvia chamelaeagnea looks beautiful when flowering with blue agapanthus. The white form looks lovely mixed with other green foliage plants, giving the garden a fresh and cool look during the midsummer heat. Plants can be maintained in the garden for several years, but need to be cut back after flowering to keep them tidy and vigorous. Salvia chamelaeagnea can be propagated from seed or cuttings. Sow the seeds in spring in a seed tray filled with a well-drained medium. The young seedlings grow fast and can be planted into individual containers as soon as they are big enough to handle. They respond well to organic fertilizers and can be planted out as soon as the roots are nice and strong. The tips of the stems can be pinched to form bushy plants. Seedlings flower from a year to 18 months after sowing. To get a selected colour form it is best to propagate the salvia from cuttings. These can be made from the young shoots which form at the bottom of the plant in spring and early summer.